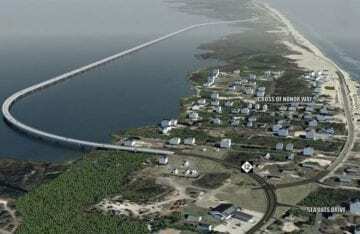 About 3,500 feet of N.C. 12 just north of Rodanthe and the S-Curves is being shifted roughly 20 to 30 feet to the east to make way for upcoming construction on the new Jug Handle Bridge. “Shifting Highway 12 a little to the east will make it safer and easier for people for people to (travel through) the area,” said NCDOT Public Relations Officer Tim Haas. The temporary move will remain until construction is completed on the Jug Handle Bridge. Based on the current schedule, the bridge is expected to open to traffic by late 2020. The 2.4-mile Jug Handle Bridge — along with the Captain Richard Etheridge Bridge on Pea Island, which was completed in the spring of 2018 ––is considered part of Phase II of the Bonner Bridge Replacement Project. During the move of the roadway, and during the ensuing construction, daytime lane closures may occur from Monday through Friday until June 14. One lane of traffic will remain open during the closures. From June 14 through Sept. 14, only nighttime lane closures will occur to accommodate summertime traffic. Soon to be the Sheepshead fishing capital of the East Coast !! !